Filler unit is 64″ wide (load side, not including control panel) x 63” deep x 83″ high (±12”). Heavy-duty tubular carbon steel adjustable height frame provides for future bag size flexibility. Unit features a stainless steel bag filler inlet tube. Inlet tube has an outer dust control sleeve to allow for dust take-off. FDA approved inflatable spout seal and stationary inflation ring provide a dust- tight connection to bulk bag fill spout. Unit includes our adjustable positive snap action bag strap hooks. 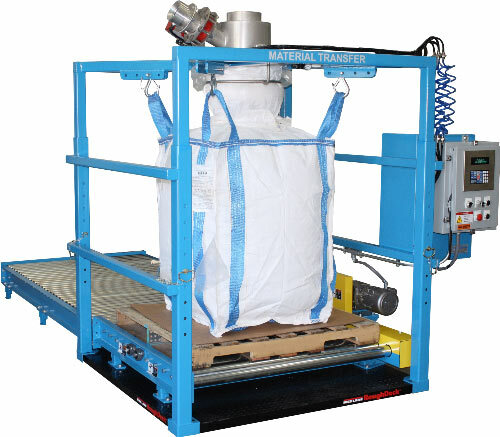 Bag inflation system removes folds in bulk bag prior to filling for enhanced stability and maximum fill volume. Unit features a fully integrated carbon steel gain-in-weight platform scale system with a digital weight indicator. Scale controller provides automatic control of existing fill valve and bag inflation system. Base of filler unit includes a powered roller conveyor to discharge filled bulk bags on pallets out of the filler. Unit includes a 50” wide x 8’ – 0” long gravity roller discharge conveyor with floor supports.